The Atlantic (atlantic.com, by Hanna Rosin, March 19, 2014) published an article called The Overprotected Kid, decrying the loss of creativity on playgrounds and suggesting that society has gone too far in creating 'risk-free' environments for our children. I read the article with particular personal interest because I designed playgrounds as part of Grounds For Play, Inc. for 22 years, and the expert they quoted in the article, Dr. Joe Frost, was my mentor in the study of children's play. I was a parent in the 70's and 80's and I certainly felt the same paranoia discussed in the article. The article bemoaned the drastic changes that began in the mid-1970's, changes sparked by new (1977) information about the number and seriousness of injuries occurring on playgrounds. Joe and I, along with dozens of other concerned professionals, sought and created new national safety standards. These standards led to the creation of safer equipment, and one unintended consequence was less creative play environments, especially at public schools and parks. Having watched this process from the inside, I agree that far too much creativity was lost--but not because of safer standards. It was due to the over-application of these standards and a lack of understanding of a child's need for 'perceived risk.' I would call it a lack of common sense. Joe, along with myself and another of Joe's protégés, Dr. Eric Strickland, advocated play environments high in perceived risk—what the child perceived as risky—but with common sense safeguards in place. Our approach resulted in stimulating environments where children wanted to play, but where actual risk was low. 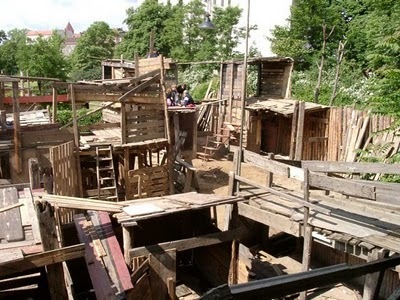 The Atlantic article idealizes 'adventure playgrounds,' where kids play with very little adult supervision, and in junky play environments reminiscent of the play many of us enjoyed on open lots or in the woods. Sure, the idea of kids using found materials – crates, tires, mattresses, and cardboard—to build their own play empires has great appeal. It appeals to my nostalgic side. But I and other playground experts reviewed the case files of children killed or seriously injured on unsafe playgrounds. In the majority of injury cases, lack of supervision played a part. So no, I'm not an advocate for less supervision on playgrounds. And as a builder of children's environments, I did everything in my power to avoid the need to face a parent of an injured child. The penalty for unsafe play environments involves injury to some parent's precious child, and that's just too steep a price. What was missing from the Atlantic writer's account was a discussion of the common sense response to any new information. I responded, as did most parents of the 70's, 80's, and 90's, to the information I received back then, and that information scared the living daylights out of me! Stories of sexual abuse, abduction, and random violence filled the headlines. Thinking people respond to what we learn. To ignore new information is the definition of stupidity. As playground designers at Grounds For Play, Eric and I never ignored new information on injuries, but we did view it with common sense. We always used the national guidelines and mixed them with the common sense realization that kids will find a risk level that suits them. If we don't provide appropriate risk in the environment we build, kids will find it inside or outside that environment by doing things that adults do not plan for. Ever see a kid scale the outside of a climber and perch on its roof? I rest my case. The environments we created at Grounds For Play contained not only appropriate risk but also places for art, music, science, gardening, and social interaction—lots of it. Such environments were safe and stimulating. Grounds For Play, in its 30-year history building 13,000+ play environments, has never been named in a lawsuit for injury to a child. I didn't say they'd never lost a lawsuit; they have never even been named in one. So it is possible to have creative and safe play environments. Once upon a time, children had freedom to move unattended about their neighborhoods. I did that as a child growing up in the late 50's and 60's. It was a wonderful childhood, and my freedom was enhanced because I grew up in a small town in Floyd County, Texas. My best friends drove pick-ups to help their farming dads when they were 4th graders. In first grade, I began walking by myself the four blocks to Andrews Ward Elementary. In those days teachers' biggest complaints were about kids who chewed gum in class. Want to know how much times have changed? I'll give you three words: Sandy Hook Elementary. Obviously, we live in a drastically different America. Mass killings, bullying episodes, and other morally corrupt acts fill our headlines today. The reasons for this are many, but regardless of the reasons, parents look for ways to protect their children. Some of these responses go overboard, but the motive is valid. In a sense, the changes on playgrounds represent the overall move toward over-protecting our kids. That's what the Atlantic article pointed out. But what it did not point out is that change is appropriate in the face of new information, new threats. When we learn about dangers in our world, it's right to make changes to address those dangers. That's what we did when playground injury data first became available in the 70's, and that's what parents of the 70's did when it became clear that child abuse was a growing problem. It's what parents do now by giving their kids a bit more freedom in response to data about the ills of overprotection. Let's not fool ourselves and turn back the clock to the nostalgia of rural America. That time has passed. Good parenting practices, like good playgrounds, require common sense. So here are three steps parents can take to be sure they don't hear new information and go overboard. 1. Respect the wisdom of the ages. Old information may be old, but that doesn't mean it's outdated. Grandparents and Biblical truths often provide the perspective a new generation of parents needs in The Information Age. Don't neglect the old truths just because they are old. 2. Check the motive of the information source. For example, the education industry, including education researchers, is driven by the economic need to sell new books, curricula, and textbooks. So they have a vested interest in trying new programs. This has led to numerous educational campaigns that were new, but not better, and sometimes catastrophic. New Math was all the rage in the 70's, and it proved disastrous! Again, compare the new approaches to the wisdom of the ages. Every blog, post, or news source has a point of view. Be aware of it! 3. Relax and consider the middle ground. Yes, the new childcare center down the road seems glitzier and the computers are the latest. But do they mix in what 100 years of early childhood practice has found to be critical for young children: a stable work force, hands-on active learning, and a focus on social skills rather than academics (in the early years especially?) Find a school that blends the best of technology with the best of traditional early childhood education. The Atlantic article's author was right that children need the freedom to overcome risk in play, but not in environments proven to be unsafe, though they might be nostalgic.